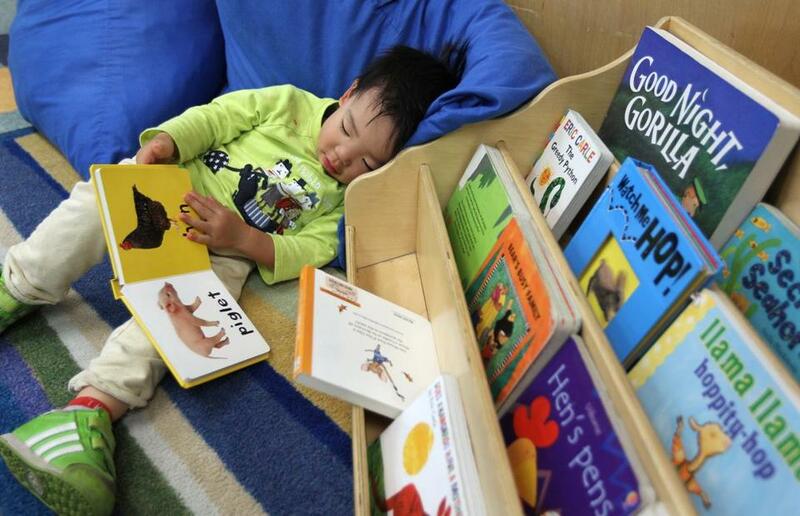 Joon Lim, 2, relaxes with a book at a day-care center run by Bright Horizons, which has been a number one employer three times. Director Kimberly Bouris and Ella Benvenuto, 4, exchange high-fives. David Lissy learned valuable lessons about customer service working in a restaurant during high school and college, lessons he is still applying today. The chief executive at the global day-care giant Bright Horizons Family Solutions shows new managers that he values them by serving them lunch in his Needham home and then inviting them into his living room to chat. “I always felt like, in anything I did, that people will be better motivated and more engaged with whatever it is you’re doing when they feel you, as a leader, are listening,” Lissy said. The Watertown company, which earned the top spot among the largest employers in the Top Places to Work list for the third time in four years, employs about 18,000 people in the United States and frequently promotes from within. Bright Horizons recognizes that its caregivers do challenging but often underappreciated work by paying them above the industry average, said Lissy, noting that there is no difference between his health care plan and the typical employee’s. Lissy has tried to create a work environment where there is “not too much hierarchy,” and everyone feels heard. He stays in touch with employees by taking road trips with other company leaders to visit centers around the world. Each new class of managers in the company also takes a “cultural tour” of the company’s beginnings in Boston, including a trip to the very first Bright Horizons day-care center in the Prudential Center. When Bright Horizons started a tuition-reimbursement program, company officials learned it would be more popular if they offered the funds up front. And now they do. Bright Horizons believes in recognizing the work done by employees like Daniela Salerno. “Even as we grow, we’re not sitting in some ivory tower trying to make decisions,” Lissy said. It’s all part of making a big and growing company with centers in Ireland and India feel like a community that cares about everyone’s needs. Those happy employees, Lissy said, are better able to serve others.